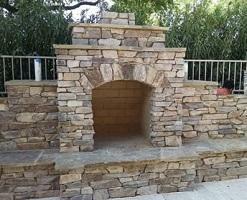 Browsing outdoor fireplaces in Paradise Valley? 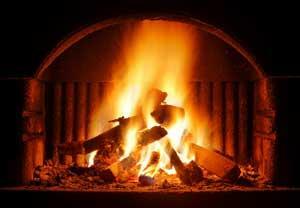 A fireplace adds warmth to your home, and not just by raising the temperature. It makes it feel more inviting and welcoming for friends, family, and other loved ones. And it works as an ideal gathering place, especially outside. If you're considering outdoor fireplaces in Paradise Valley, let Desert Environments handle everything for you. From helping with the design to installation to routine maintenance, we'll make sure your fireplace continues burning bright. If you're thinking of adding an outdoor kitchen or lighting, we can add all of them at once for seamless integration. We'll keep it far enough away from any water features too! One of the most crucial aspects of your outside fireplace is the design. You want your fireplace to match your landscaping yet stand out at the same time. We can help with that. With a number of style options, we'll find the one that's perfect for you. River rock fireplaces work great in conjunction with water features to create a matching theme. Kiva fireplaces are larger at the bottom and are efficient both in getting rid of smoke and radiating heat. Custom fire pits are a good choice for controlled open flames and wide heat distribution. And they're a great way to roast marshmallows! Thinking of something else? Run your style and design by us and we'll do what we can to make it work! 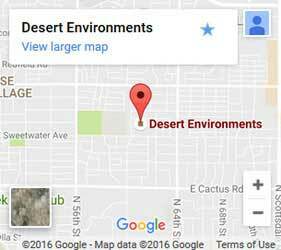 When you choose Desert Environments, you're choosing a dedicated landscaping contractor with over 25 years of experience in the area. But we do so much more than simple lawn care. Our knowledgable technicians are also custom designers and hardscapers and can add any type of landscape architecture you want to your yard.